The Grand Canyon, in all of its beauty and awe, provides onlookers with many options; options that dictate how one is going to experience this massive expanse of rock and dirt. Divided into several rims, the Grand Canyon delivers many means for tourists on how they get to see what this natural formation has to offer. Whether they want to get up close and personal with the canyon’s wildlife or want to stay as far away as possible, the Grand Canyon’s west rim is a popular tourist spot. The west rim is a convenient stopping point for sightseers coming in from the city of Las Vegas, as it poses only a 3.5 hour trip. Much like its southern counterpart, the west rim is open year round and offers plenty of tourist attractions. 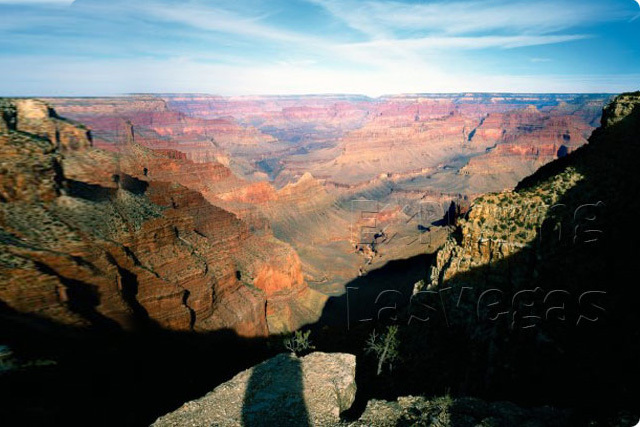 At its highest point, the west rim is set 4,000 feet above the Grand Canyon’s rocky floor and offers a somewhat narrow view of the canyon’s surroundings. It does, however, provide one of the best views of the Colorado River. Where the southern rim offers museums and other tourist-like attractions, the west rim has a somewhat newer and definitely different approach at attract the crowds. Jutting 70 feet from the top of the west rim, the Grand Canyon skywalk delivers an unrivaled view of the Grand Canyon and the Colorado River. 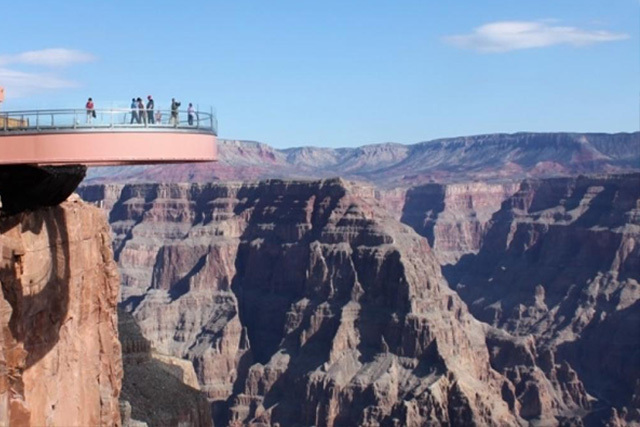 If the overlook doesn’t offer enough of a thrill, you can simply look beneath you, where you will be greeted by a completely transparent floor and a 500 foot drop below. Didn’t get that sick feeling in your stomach when you stared down upon the massive drop below? Maybe you should take part in some of the west rim’s adrenaline pumping adventures. From white water rafting to flying in a helicopter straight through the gorge itself, there are few things that are more exhilarating. You will get a much closer look at the canyon’s wildlife as well as find yourself with plenty of photo opportunities that most simply do not get. Once you’re done adventuring, you can head back up the rim on horseback, so you can get the feeling that you’re a truly in the country. On horseback, you’ll pass close by wildlife like jackrabbits and big horned sheep, bringing you even closer to the Grand Canyon’s natural inhabitants. The natural wonder of the Grand Canyon is viewable when you travel, by hummer, from Las Vegas, Nevada on the Grand Canyon West Rim Tour. Your tour guide will meet you at your Las Vegas resort. It is with this guide that you will explore all of the sights to see from the city of glitz and glamour all the way south to Grand Canyon West! The Grand Canyon was chosen as one of the Seven Natural Wonders of the World and with good reason. Your tour will take you through other natural and manmade wonders in the greater Las Vegas area. As you travel by hummer, expect to see the Hoover Dam, the vastness of the Mojave Desert, and the Joshua Tree Forest before arriving at the Grand Canyon! During the Grand Canyon West Rim Tour, you will travel in a specially equipped, Hummer H2. Each hummer is air-conditioned so you can cool down as you explore the hot desert. As you travel through the natural splendor that encompasses the desert of Southwestern Nevada, your tour guide, who is highly qualified and knowledgeable about the area, will provide helpful and fun information on your surroundings.